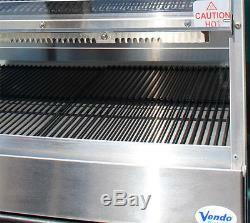 Vendo Mini Hot Food Display Case (HFDM). Fresh, hot food is one of the fastest growing segments for convenience stores. The Mini HFD was designed to hold wrapped hot foods. Food Timers: 12 multi-selection, adjustable timers 30 minutes - 4 hours (in 30 minute increments). Flexible Temperature: 4 heating zones can be individually adjusted to the various products being held. NSF Certified: Quality and safety guaranteed through NSF certification. Attractive: Xenon light bulbs create a well-lit product display for maximum customer appeal. Serving Ability: The Mini HFD has lift up front doors making it perfect for self serve applications. Low Air Flow Dual Fan: Low air flow dual circulation fans help maintain an even and consistent product temperature throughout the case. This can be obtained through by contacting EFMCo. Items showing evidence of installation or use are Non-Refundable. 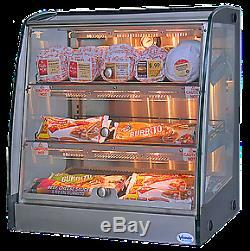 The item "Vendo HFDM Food Warmer Display Case Commercial Pizza Counter Top Burrito Cabinet" is in sale since Friday, August 3, 2018. This item is in the category "Business & Industrial\Restaurant & Food Service\Commercial Kitchen Equipment\Storage & Handling Equipment\Heating & Holding Cabinets". The seller is "efmarianico" and is located in Salt Lake City, Utah. This item can be shipped to United States.